When we speak of Steel shading usually mean the material used for the supporting structure . The steel or aluminum can be used both but the second is preferred when the structures to be achieved must not bear large loads.In fact, the aluminum , being lighter , is not suitable to support large Sunscreening systems installed on the wall . Alongside these classic materials is nevertheless catching on another product can be used both in the backbone and in the slats of the sunshades.The COR-TEN. This particular material has a low percentage of alloying elements but has a high mechanical strength and has been used in the realization of noise barriers on different motorway sections . 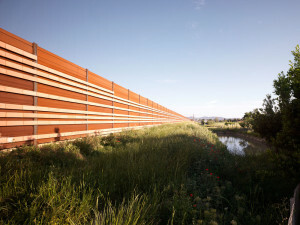 For here it is where it appeared for the first time , and where it has been noted for the nuance ” copper ” which was integrated harmoniously into the landscape . Now many architectural firms have re-evaluated this material dedicating entire achievements and feeding it more and more often in the projects . Therefore we offer shading COR-TEN combining the product brise soleil with this renewed material for food constantly pushing towards evolution and innovation. The solar shading panels achievable with the aforementioned materials may be the most diverse uses, as a coating on windows of buildings , as for sliding windows and balconies , as cabinets and gazebos for gardens or patios , and as fences in gardens and deleted perimeters. 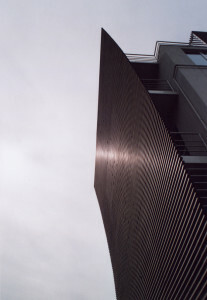 The function of shading steel or shading COR-TEN is to screen and darken a room or a space from the sun , in fact, the shading effect that arises from the oblique positioning of the slats wood allows to limit to 70 % the passage of the sun and heat , also guadagnandone in terms of energy saving . It also performs another very important function that is to confer greater privacy and confidentiality to an environment , compared to the external look of neighbors and / or foreign. (c) Albero Maestro S.r.l. Tutti i diritti riservati.